Big thanks to Michelle and Adam for hosting! Also thanks to Mitch K, Katie, Tammy, Maddy, Tim and Ethan for their erudite presentations. Background: Historically, the only 2 pre-hospital interventions demonstrated to improve survival with good neurologic function after OHCA have been early defibrillation and bystander CPR. Epinephrine, used in cardiac arrest since the 1960s, has consistently been shown to improve ROSC without improving neurologic outcomes. There are physiologic pros and cons to epi: alpha effects promote vasoconstriction, increasing aortic diastolic pressure and augmenting coronary blood flow and the chance of ROSC. Beta effects can cause dysrythmias, increase myocardial O2 demand and platelet activation, and impair microvascular blood flow leading to long-term organ dysfunction of heart and brain. Article #1: Perkins GD, Ji G, Deakin CD, et al. A Randomized Trial of Epinephrine in Out-of-Hospital Cardiac Arrest (PARAMEDIC2). NEJM. 2018; 379: 711-721. This is the largest randomized data set on the use of epinephrine in OHCA. In this pragmatic RCT from the UK and 5 National Health Service ambulance services, a total of 8,014 patients received 1 mg epinephrine every 3-5 minutes vs. placebo for OHCA. Groups were well balanced with regards to baseline characteristics. The primary outcome was 30-day survival. Secondary outcomes included survival until hospital discharge with a favorable neurologic outcome (modified Rankin scale, mRS ≤ 3). There was a large difference in achieving ROSC favoring epi (36% vs 12%), and at 30 days, significantly higher overall survival in epi patients (3.2% vs 2.4%). However at hospital discharge the same percentage of patients had favorable neuro outcome in both groups (2.2% epi, 1.9% placebo), and more survivors in the epi group had severe neurologic outcomes, mRS 4 or 5 (31% vs 18%). --Median time from EMS call to epinephrine = 20 minutes (into “metabolic phase” of cardiac arrest). Early epi has been associated with improved outcomes. --All centers were in the UK, limiting external validity. --Low overall survival, although this is partially explained by exclusion of >600 patients with ROSC immediately after defibrillation and therefore never needed epi. --Hospital care was not standardized, although national guidelines were followed. --No data were reported on baseline neurologic status of patients. Conclusion: Epinephrine saves bodies, but not brains. Observational trial in Japan of 118,000 patients with bystander witnessed OHCA and non-shockable rhythm, with intent of determining time-dependent effects of pre-hospital epinephrine administration. Due to the organization of the EMS system in Japan, some patients never received pre-hospital epi, and outcomes for this group were based on duration of time from CPR initiation by EMS to hospital arrival. The primary outcome was 1-month survival with good neurologic outcome (cerebral performance category 1 or 2). There was a lot of slicing and dicing, but bottom line was an association of better outcomes if short transport time to the hospital or early epinephrine in the field. The study didn’t include any data on the number of patients with poor neurologic outcomes, and is an observational trial with all limitations intrinsic to a retrospective data set. Conclusion: Early epi was associated with improved neuro outcomes in witnessed OHCA with non-shockable rhythm in this retrospective observational study. Article #3: Belletti A, Benedetto U, Putzu A et al. Vasopresors During Cardiopulmonary Resuscitation. A Network Meta-Analysis of Randomized Trials. Critical Care Medicine. 2018; 46(5) e443-e451. In this network meta-analysis (statistical approach to compare multiple interventions/treatments), 28 RCTs of nearly 15,000 adults with either IHCA or OHCA receiving vasopressors were evaluated to identify preferred vasopressor for the outcomes of ROSC, survival, and survival with good neurologic outcome. PARAMEDIC2 was not included due to timing of publication. Only a combination of epinephrine, vasopressin, and methylprednisolone was associated with increased likelihood of ROSC, and survival with good neurologic outcome. This therapy combination was evaluated in 2 studies in patients with IHCA. When analyzing OHCA arrest studies, no treatment was superior over others. When evaluating shockable rhythm and non-shockable rhythm separately, again there was no vasopressor treatment superior to another. There is no significant randomized evidence to support nor discourage the use of epinephrine during cardiac arrest. Many thanks to Mike and Sarah Marynowski for hosting and to Matt DeStefani, Elisa Wing, Maddy Hawkins, Huu Tran, Jenny Denk and Jeff Florek for their outstanding analyses! Article 1: Friedman BW, et al: Diazepam Is No Better Than Placebo When Added to Naproxen for Low Back Pain. Ann Emerg Med 2017;70:169-176. In this double blind RCT, 114 patients with non-radicular, atraumatic acute low back pain without “red flag symptoms” treated at one urban health care system were either treated with naprosyn + diazepam or naprosyn + placebo. All patients received a teaching session about care of low back pain and were discharged from the ED. Seventy percent of patients in the diazepam group did take the diazepam one or more times daily. Primary outcome was improvement on a validated functional impairment survey, Roland Morris Disability Questionnaire (RMDQ), at one week. Secondary outcomes included pain intensity at 1 week and 3 months, frequency of pain, and frequency of analgesic use. A strength of this study was the use of these patient centered outcomes. Results: Functional improvement as measured by the RMDQ at one week was exactly the same between the 2 groups. There were also no significant differences in the secondary outcomes, although trends favored placebo for both longer term improvement as well as for adverse events. Limitations: There were a number of exclusion criteria, limiting generalizability. Results were susceptible to recall bias, as patients had to think back to prior symptoms. Dosing schedule was not rigid, although this mirrors real life. Practice changing? Yes, for Elisa and Matt. It would be nice to have included a reliable assessment for muscle spasm, but the vast majority of these patients were felt to have muscle spasm by the practitioners. Unfortunately prior studies have demonstrated limited utility for other analgesics in treating low back pain. Yoga may help, acupuncture may help, and for uncomplicated low back pain, time helps; at 3 months 90% of patients had resolved pain. Bottom line: Given the results of this and other prior studies, and the concern for impairment/abuse from using diazepam, only a minimal number of physicians at JC will plan to prescribe diazepam to this patient population. At best, they will reserve diazepam for severe spasm, and associated insomnia/anxiety. Article 2: Hayward GN, et al: Effect of Oral Dexamethasone Without Immediate Antibiotics vs. Placebo on Acute Sore Throat in Adults: A Randomized Clinical Trial. JAMA. 20 I 7;8(317)1535-1543. In this double blind RCT of 565 adult patients with acute pharyngitis deemed not to require immediate antibiotics and treated at 42 family practice sites in England, patients received either one dose of 10 mg oral dexamethasone or placebo. Primary outcome was complete resolution of symptoms at 24 hours. Secondary outcomes included complete resolution of symptoms at 48 hours, duration of moderately bad symptoms, and suppurative complications. The majority of patients did use OTC analgesics for symptom control. Rapid strep testing was not available, although 15% and 19% of patients in the 2 groups ended up with positive Strep cultures. Although complete resolution of symptoms at 24 hours may seem an unrealistic primary outcome, it has been used before and facilitated a high response rate. Results: For the primary outcome, at 24 hours 23% of the dex group compared with 18% of placebo group achieved complete resolution of symptoms (RR 1.28, NNT = 20), which was not statistically significant. At 48 hours, there was a significant difference (35% in dex vs 27% in placebo) in complete resolution of symptoms (RR 1.31, NNT = 12). Results were similar for the 40% of patients offered a “delayed” antibiotic prescription vs. those not offered delayed antibiotics. There were no significant differences in any other secondary outcomes. Limitations: The study was underpowered to detect differences in adverse outcomes. Potential adverse effects of increased steroid prescribing are uncertain. Patients in this study were young with good access to primary care. Practice Changing? Huu and Maddy are not sold. While prior studies have demonstrated very positive effects for dexamethasone in patients with pharyngitis also treated with antibiotics, results in this trial of less severe pharyngitis were more modest. Bottom line: Although the JC crowd would like to be able to offer additional symptom control to our patients with pharyngitis regardless of severity, indiscriminate use of dexamethasone was not supported, and most plan to reserve steroids for severe pharyngitis. Article 3: Buxbaun JL, et al: Early Aggressive Hydration Hastens Clinical Improvement in Mild Acute Pancreatitis. Am J Gastroenterol 2017;112:797-803. In this randomized trial of 60 patients with acute mild pancreatitis (no SIRS or organ failure), half received early “aggressive” IVF using LR with 20 cc/kg bolus followed by 3 cc/kg/hour vs. “standard” IVF with 10 cc/kg bolus followed by 1.5 cc/kg/hour. Patients were assessed at 12 hour intervals, with fluid adjustments and po status decisions based on HCT, BUN, creatinine, and pain level. Primary outcome was a combined endpoint at 36 hours of decreased HCT, BUN, creatinine; improved pain; and tolerance of oral diet. Secondary outcomes included the rate of clinical improvement, development of SIRS, development of severe pancreatitis, and volume overload (defined by physical exam). Results: Significantly more patients in the aggressive fluids group had clinical improvement at 36 hours (70% vs. 42%, p=0.03, NNT=4), and persistent SIRS occurred less commonly with aggressive fluids (7.4% vs. 21%; OR=0.12, 0.02-0.94; NNT=8). The rate of clinical improvement was significantly greater in the aggressive IVF group. Limitations: Although no patients in the study developed signs of fluid overload, patients at risk for volume overload were excluded, limiting external validity. The composite outcome has not been validated. Patients overall were relatively young and healthy. It’s a really small study; persistent SIRS developed in 2 vs. 7 patients. Practice Changing? This is not a high enough quality study to be practice changing per Jenny. Jeff was more willing to follow the paper’s recommendations. However, studies on severe pancreatititis have demonstrated negative outcomes associated with aggressive IVF; third spacing, ARDS, renal failure, CHF, abdominal compartment syndrome: aggressive IVF treatment should be reserved for patients with mild pancreatitis. Bottom line: Overall, the majority at JC felt aggressive IVF are appropriate for patients with mild pancreatitis, and do align with current American College of Gastroenterology recommendations for fluids in pancreatitis. Journal Club Thursday July 13, 2017. Contrast Induced Nephropathy. Thank you to Harwood for an evening of pastoral scenery and champagne cocktails, and to Marshalla, Graeme, Stanek, Ashley, Oyin, and Anita for their pithy analyses. Background: Acute kidney injury (AKI) is associated with overall worse short-term outcomes including dialysis and death. Uncontrolled studies have suggested IV iodinated contrast material is a risk for contrast material induced nephropathy (CIN), a form of AKI. Therefore, contrast is a risk for dialysis and death, and should be avoided in patients with pre-existing/past renal dysfunction, or with other high-risk conditions such as diabetes, HIV, HTN, and CHF. Article 1: McDonald RJ, McDonald JS, Carter RE et al. Intravenous contrast material exposure is not an independent risk factor for dialysis or mortality. Radiology. 2014;273:714-725. In this retrospective single center study from Mayo, 10,673 patients receiving contrast (C) for abdominal/pelvic/chest CTs were propensity score matched with an additional 10,673 patients who received non-contrast (NC) CTs, to compare outcomes of AKI, 30 day dialysis, and 30 day mortality. AKI developed in 4.8% (C) vs. 5.1% (NC), dialysis in 0.2% (C) vs. 0.3% (NC), and mortality in 8% (C) vs. 9% (NC). In “high risk” groups with diabetes, CHF, or acute/chronic renal failure, risks of dialysis and death were higher, but there were no significant outcome differences in high risk patients who received contrast vs. non-contrast CTs. Yes, if AKI developed, rates of dialysis and death were higher, and rates of dialysis and death were higher in patients with poor baseline renal function, but contrast material exposure was not an independent risk factor for these bad outcomes. Limitations: It’s a single center retrospective study. Unknown why certain high risk patients were chosen to receive contrast. Causes of mortality are not identified. Although it’s controversial if anything helps for nephroprotection, authors did not identify what agents (NS, bicarb, NAC) were used or how often. And, although a large study, only 958 patients with baseline creatinine ≥ 2.0 received contrast. Bottom line: IV contrast material for CT scans was not associated with increased risk of AKI, dialysis, or death, even in traditionally high-risk patients. Article 2: McDonald RJ, McDonald JS, et al. Risk of Acute Kidney Injury, Dialysis and Mortality in Chronic Kidney Disease Patients following Intravenous Contrast Material Exposure. Mayo Clinic Proc. 2015;90:1046-1053. Again from Mayo, a retrospective look at 1220 patients with chronic kidney disease (CKD) Stage III (GFR 30-59) and 491 patients with CKD Stage IV/V (GFR < 30), all receiving IV contrast CTs and propensity score matched with patients receiving non contrast CTs. Again, rates of AKI, 30 day dialysis, and 30 day mortality were compared between contrast and non-contrast groups. Many of these patients were included in prior work by McDonald. For this study, they performed full chart reviews and included a more comprehensive list of clinical variables in the propensity score model in an attempt to improve the strength and accuracy of the conclusions. For all stages of CKD and across all outcomes, there were no significant differences between groups. Stage 3 CKD group, AKI 10% (C) vs. 15% (NC); dialysis 0.4% (C) vs. 0.4% (NC); mortality 9% (C) vs. 11% (NC). In the stage 4/5 CKD group, AKI 21% (C) vs. 20% (NC); HD 1.7% (C) vs. 0.7% (NC); death 18% (C) vs. 19% (NC). Additional sensitivity analysis evaluating patients with stable pre-CT kidney function, and comparing effects of IV fluid administration at the time of CT were performed, again demonstrated no significant outcome differences between contrast and non-contrast groups. Limitations reflect the single center, retrospective nature of the trial. Bottom line: Specifically in patients with CKD, IV contrast was not associated with increased risk of AKI, 30 day dialysis, or 30 day mortality. What’s this Propensity Score Matching (PSM) thing? PSM is a statistical technique used in observational studies as a way to more closely approach the strength of a randomized control trial. It attempts to approximate randomization by matching populations from large databases according to patient characteristics, risk factors, and co-morbidities. This minimizes bias associated with treatment assignments, however PSM only accounts for measured/observable covariates/confounders. Hidden bias is therefore still likely. PSM also requires large patient populations. Article 3: Hinson, JS et al: Risk of Acute Kidney Injury After Intravenous Contrast Media Administration. Ann Emerg Med 2017;69:577-586. From Johns Hopkins, a single-center retrospective analysis of nearly 18,000 adult ED patients with baseline creatinine < 4.0, cohorted into three groups: CT with contrast, CT without contrast, and similar patients without CT.
Primary outcome was incidence of AKI, and secondary outcomes were development of new CKD, dialysis, and renal transplant, all at 6 months. Rates of AKI were similar: 10.6% (with contrast) vs. 10.2% (no contrast) vs. 10.9% (no CT). IV contrast was also not associated with increased risk of the secondary outcomes of CKD, dialysis, or renal transplant at 6 months. Authors did examine treatment decisions including administration of IV contrast and the administration of IV fluids. Physicians were less likely to use IV contrast in patients with decreased renal function, and more likely to administer IV fluids when using IV contrast. Limitations: Another single center retrospective study. Most patients were admitted to the hospital, reflecting higher acuity, and may overestimate the incidence of AKI in the general ED population. Most patients had pre-test creatinine ≤ 1.4. Bottom line: IV contrast administration was not associated with increased incidence of AKI, new CKD, need for dialysis or need for renal transplant. Poll at the end of the evening: after evaluating these studies, overall attendings feeling more comfortable ordering needed CT scans with IV contrast on patients with GFRs down to around 35. For potential life threatening diagnoses, attendings consistently support giving contrast (trauma, dissection). Protection? Data are all over the place, but most attendings will give IVF. Journal Club bottom line: Understanding of CIN has been complicated by reliance on studies predating the use of low/iso-ismolar contrast, and extrapolation from arterial angiographic studies. These current 3 well done studies challenge the notion that IV contrast administration for CT scans is a risk for AKI, emergent dialysis, and short term mortality. A large prospective study is required to definitively end this controversy, but this literature supports using IV contrast when medically indicated, even in patients with chronic kidney disease, diabetes, and CHF. How to Eat Healthy Meals At Restaurants...great piece from our friends at the NY Times about how to make smart choices when trying to eat out in the land of the Super Size. The History of Supersizing...How did we end up with this ridiculous option in the first place? Go out to eat, and try out your newfangled knowledge! Special shout-out to my man and successful procreator-in-chief Trale "Trale Bear" Permar for clueing me in to an amazing workout opportunity right in our South Side backyard! The Swallow Cliff Stairs are a mere 20 min from our hospital, and provide endless fitness opportunities. With over 125 stone stairs built into the side of a steep cliff, you will not have a problem getting your heart rate up! I went after a 6a shift to check out the stairs, and was able to complete 6 up & down circuits before the wind chill and my wobbly legs forced me back into the car. So do yourself a favor and go to Swallow Cliff and get going! You can walk the stairs, run them, throw some weights in a backpack and train like a mountaineer, or make up your own variations! Before you know it, you'll be as strong as a Trale Bear! An 18 y/o male presented to the ED with chest and back pain that started in the center of his chest, then moved to left scapula. Pain was sharp and worse with deep inspiration. His only associated symptoms was anxiety. No risk factors for heart disease, PE. As you've probably noticed, the radiologist misread the film- or dictated onto the wrong chart, or made some other mistake that we're all capable of making. So this case serves as both a reminder to get into the habit of looking at all your own films, and a review of a neat CXR finding. 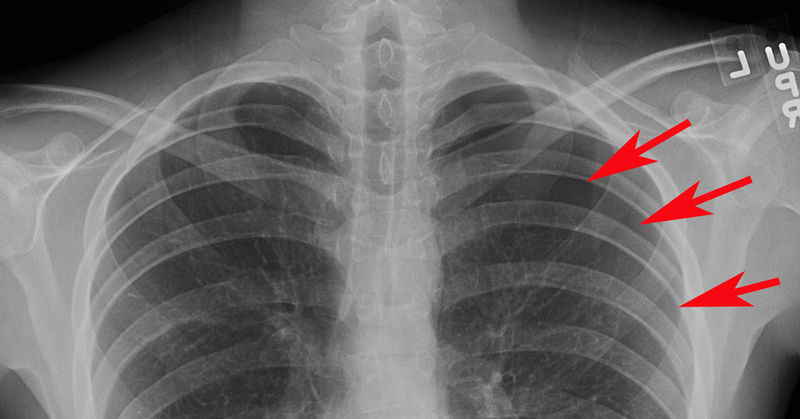 Spontaneous pneumomediastium is fairly rare. It occurs when air leaks out of a ruptured alveola and tracks along the bronchovascular sheath until it reaches the mediastinum. Air can also track to the pleural space, as in this case, or into the subQ tissues, submandibular and retropharyngeal space, or even into the spinal canal (see Dr. Permar for more information on this complication). Triggering factors can usually be identified but are so common (crying, Valsalva, coughing, vomiting) that they don't rule in the disease. The most common presenting symptoms will be pain wherever the air has tracked. Physical examination will likely be normal with isolated pneumomediastinum, although you may be lucky enough to hear Hamman's crunch (crepitus heard over the heart). You may feel subcutaneous emphysema if the air has tracked there. Patient's with large pneumothoraces may have decreased breath sounds or hypoxia. Spontaneous pneumomediastinum is generally a self-limited disease without serious sequelae- much different than if caused by Boerhaave's or trauma. It requires no treatment except analgesia as needed. This patient was admitted for treatment of his pneumothorax. This is all burpees, baby! Here's some more burpee love from Funk Roberts. I finished this bad boy in 8'35" and got my HR up to 99% of my calculated max. The shorter you can keep the rests, the more intense it will be! Happy New Year! Weekly Wellness is back for 2015! Just a reminder, my goal is to encourage healthy lifestyle habits by of providing interesting articles on topics covering nutrition and fitness, as well as give you ways to live a more healthy lifestyle with delicious recipes and workouts you can do at home in less than 20 minutes with no special equipment. I am always interested in learning more, so if you have any great recipes, know a good article, or have a workout you'd like to recommend, please pass it along! Keep making healthy choices when you can! Just made this last night, and oh boy was it good! You can use any kind of squash, (I used acorn), but I would roast the squash & red onions for double what Martha recommends (30 min vs 15 min). The flavors are awesome (don't skimp on the sage), and its healthy and lean and pretty darn easy! I used a rolling pin to flatten my chicken breasts. Throw on some motivational music, and give this a whirl. Don't stop the clock for breaks. My time was 14:14, and I got my heart rate up to 97% of my maximum calculated. Calculate your heart rate here, and see how close to your max you can get! 36 yo M, no pmhx, appears morbidly obese, no hx of HTN,but has been told once he has borderline HTN, takes no meds. Presents by car with his father. Patient states he had sudden onset left upper chest pain that radiated to his neck with mild sob and mild lightheadedness that started when he was walking up stairs. He states the sob and lightheadedness have resolved and now the chest pain is mild. It did not radiate to his back. Nonexertional, nonpleuritic. No hx of DVT or PE, no leg swelling or pain. Denies abd pain. Denies diaphoresis or nausea. Pt is a smoker. Denies drug use, admits social alcohol use. Denies Fhx of early heart disease or suddent death. Well appearing morbidly obese patient with exertional onset left chest pain radiating to left neck, no radiation to back. Denies medical hx and follows w a primary doctor. Normal PE, no risk factors for PE. No fmhx of CAD. Non ischemic ekg and pain is currently mild. He did state his pain was moderate to severe at onset. At 7am near the end of signout I was called by the nurse as the patient just vomitted and BP was 100/55, HR was still 70s. I reevaluated the patient and he appeared well and stated his pain returned and was still mild left CP radiating to his neck. No other complaints besides nausea. At this point I figured he couldnt do the stress test and changed him to an admission. I decided to reevaluate if there was anything I was missing. Due to my past mental trauma from seeing 7 total patients younger than 45yo with aortic dissection in 7 years of residency/practice and 1 of those patients dying from their dissection.....I decided if I was to get any sleep I would need to get a CTA chest abd pelvis w and wo contrast prior to admission to tele. The tipping point in my mind was why was this guy borderline hypotensive if he is in pain and morbidly obese. Even with only moderate pain without alot of the classic symptoms of dissection. He even had bilateral BPs done by accident which were not marked abnormal. Also normal 2V chest and normal DDimer. All prior 7 dissections in young people that I had seen had elevated DDimers. It is NOT a sensitive test but with very low suspicion...sometimes to me it is somewhat reaasuring....THere is much debate about it's utility. Large aneursymal dilatation of the proximal aorta and aortic valve. Largest aortic diameter is 6cm. Cannot rule out dissection within the aneursym. Moderate size pericardial effusion vs pericardial hematoma. Cardiothoracic surgeon immediately paged. Cards came to the bedside. Large aneursymal dilatation of the proximal aorta and aortic valve. Largest aortic diameter is 6cm. Cannot rule out dissection within the aneursym. Moderate size pericardial effusion vs pericardial hematoma with diastolic collapse of the RV concerning for possible early tamponade. TEE confirms a dissection just above the aortic valve within the aneurysm. Moderate aortic regurgitation. Moderate to severe pericardial effusion. Patient had cardiac bypass/open chest sugery with replacement of ascending aorta w graft and his aortic valve was repaired but not replaced. Post op day #1 the patient was extubated and stated he felt fine except for some incisional pain. Almost gave this guy a stress test. He didnt even want to stay for that. Thankfully he vomitted and had borderline hypotension and thankfully I have a history w dissection that has made me a little more cautious....or I would have missed this. Could've been my second death from a missed dissection...probably on the tredmill in the stress lab. The prior death of a patient I had from dissection was a 33 yo M with a similar presentation and workup as this patient. I discharged him and he came back on my same shift and died within 30 of arrival. Normal BP on arrival. Normal bilateral BPs. 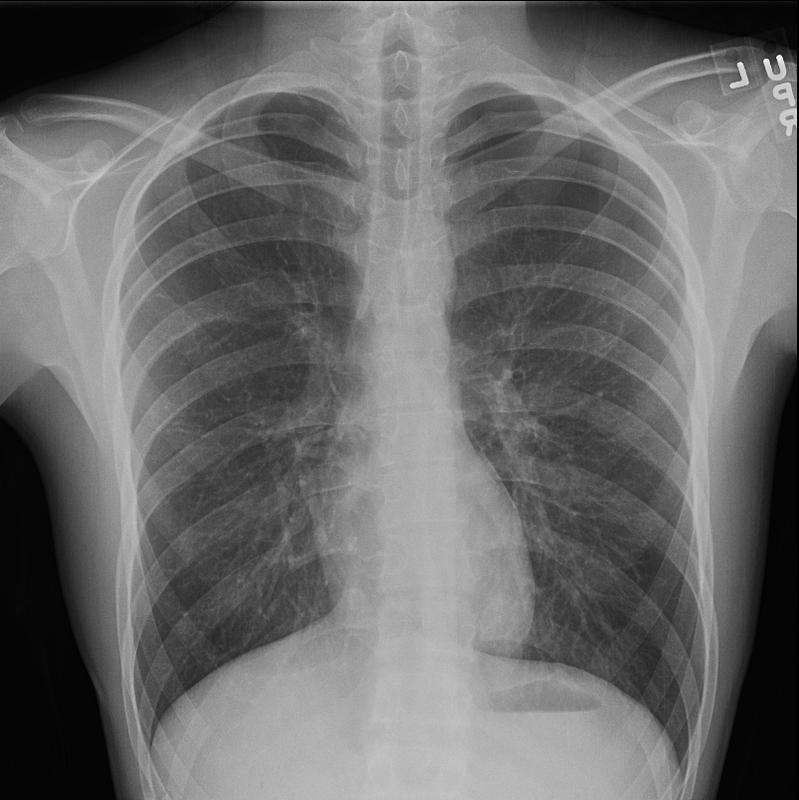 Normal 2V CXR. negative trops and ddimers.....recipe for disaster. Thanks to the resident and the next attending for fully taking over this guy at 1030 am and making sure he got the ECHO and the OR. [Obesity is a risk factor of young onset of acute aortic dissection and postoperative hypoxemia]. - Consider doing some documentation with chest pain patients that would make your chart more defensible in case you miss AD. They are easy to miss and I have been there - things you could add would be equal pulses in all 4 ext, equal bilat BPs, normal CXR, and reasoning that you think the probability of dissection is so low that CTA is not indicated. - Some experts on aortic dissection argue that its presentation can be so nonspecific that the standard of care is to not make the diagnosis.